RareScanner is an addon for World of Warcraft that detects whether a vignette has appeared in the minimap. A vignette is the little icon added in the 5.4 patch that appeard as a skull for a rare, or with other icons for events and treasures in your minimap. Since 7.0 patch it has appeared as a star. RareScanner displays a button in the middle of your screen with the name of the rare found, a little miniature of said rare and a bar with the loot that this rare drops. At the same time, it plays an alarm sound, so it can warn you when you aren't at the computer. When you click the button it will add an skull over the NPC and target it making it easier to find it. On your map you will see icons for every rare NPC, treasure or event that you discover or that someone else shares with you, showing extra information about the entity on a tooltip, such as loot, achievements information or helpful notes. Looking for groups: Since BFA, Blizzard doesn't allow using their LFG tools in addons, so sadly, everything related with looking for groups is gone. However, if they change their mind it will come back. Database reset: A lot of changes have been made in this expansion that required a clean start for RareScanner, so your addon settings will be reset the first time you login. I know this is a pain, but patching the current database could lead only to more errors, so resetting and starting fresh is the best way to go. On the other hand, I've implemented several improvements that will reduce the addon's memory use and improve its performance. RareScanner reads your minimap looking for vignettes, which will work every single time even if it had warned you already for one NPC. At the same time it will only warn you when the NPC or object is in your minimap range. As for the current patch (8.0.1) there aren't vignettes in the pre-Pandaria zones, so this addon won't localize older rare NPC or treasures/events. Can I add custom NPCs? The answer is no. As I said, this addon uses the vignette system, so if you are interested in finding a rare that doesn't appear on the minimap with a little star icon, RareScanner will never find it. Where is the option panel? You can find it under "Interface" -> "AddOns tab" -> "RareScanner". How does the map interface work? Since the addon's conception, Blizzard has added different types of rares to the game with every expansion, so this addon implements different solutions to help you track rare NPCs for every scenario. Filters: In the option panel you can find different filters that apply to rare NPCs. If you have filtered a rare, individually or by zone, you won't ever see its icon on the minimap. Individual filter: You can filter specific rares directly from the option panel or using the button "-" that appears on the main button when you find a rare. Zone filter: You can filter a whole area so you won't get alerts in that zone or icons on your map. Time seen: You can chose how long you want to keep the icons displayed on your map since the last time seen. For example, a treasure found 10 minutes ago might not be there anymore, so you can chose to hide treasure icons after 3-4 minutes. You have the same solution for rare NPCs. Permanent rare NPC: Some rare NPCs keep being a rare after death. Once you find it or someone else finds it, you will see its icon on the map. The icon will remain after death, unless you filter that rare or hide the icon manually. No permanent rare NPC: Some rare NPCs stop being a rare after death. Once you find it or someone else finds it, you will see its icon on the map. The icon will disappear once you kill it and you won't see it again with that character. World quest rare NPC: This rare NPC will stop being a rare after death, but it will return as a rare with a world quest reset. Once you find it or someone else finds it, you will see its icon on the map. The icon will disappear once you kill it, but it will show up after a world quest reset, if you or someone else finds it again. Achievement entities: There are several rare NPCs, treasures or events, that are part of an achievement. These icons will be shown constantly independently of their time seen, because 99% of them respawn in less than 1 minute, so they should always be available. You can access information about the achievement moving the mouse over the icons. RED SKULL: Indicates a rare NPC that neither you nor any of your friends have discovered yet. With every new build, the addon includes a database of rare NPCs extracted from Beta or Test servers. As is common in Blizzard, some of those rares won't see the light of day in Life servers, so this is a way to distinguish existent rare NPCs from non-existent. ORANGE SKULL: Indicates a rare NPC that is part of an achievement, and neither you nor any of your friends have discovered yet. GREEN SKULL: Indicates a rare NPC that is part of an achievement and that you have discovered. As soon as you complete the achievement it will turn into a NORMAL SKULL. NORMAL SKULL: Indicates a rare NPC that you have discovered. RED CONTAINER: Indicates a treasure that neither you nor any of your friends have discovered yet. Containers are trickier to autohide once they are opened, so if you open one and the icon remains on the map, you can hide it manually following the instructions in the tooltip. ORANGE CONTAINER: Indicates a treasure that is part of an achievement, and neither you nor any of your friends have discovered yet. YELLOW CONTAINER: Indicates a treasure that is part of an achievement. As soon as you complete the achievement it will turn into a NORMAL CONTAINER. NORMAL CONTAINER: Indicates a treasure that you have discovered. RED STAR: Indicates an event that neither you nor any of your friends have discovered yet. Events will keep being displayed even after completing it, so you will have to hide the icon manually following the instructions in the tooltip. ORANGE STAR: Indicates an event that is part of an achievement, and neither you nor any of your friends have discovered yet. GREEN STAR: Indicates an event that is part of an achievement. As soon as you complete the achievement it will turn into a NORMAL STAR. NORMAL STAR: Indicates an event that you have discovered. How does the loot feature work? In the options panel you can apply different filters to the loot you want to see on the loot bar under the main button and in the tooltips on your map. You can filter it by quality, category, transmogrification, collectibles that you don't have, etc. 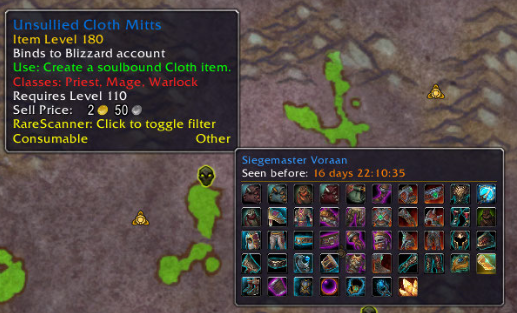 Related to the loot bar (bar of icons shown under the main button), you can configure the amount of items you want to see (up to 30) and how to display them, in one row, or several rows. RareScanner will also help you by displaying the category/subcategory of every item in the tooltip so you can track which categories/subcategories you might want to filter from the options panel, although you can click on the items directly on the loot bar, or the tooltip to toggle the filter for that specific category/subcategory. How does the log window work? Since BFA this window isn't very useful, so it's hidden by default. However, if you want to see it you can activate it from the options panel. Right now it only works like a log and you can still click on the buttons to mark and target the rare NPC found. There are several rares that you won't be able to target clicking on the button. Some vignettes' names don't match the real NPC name, so that's why it doesn't work. If you want to help, you can send a ticket for those rares you find in your client language that doesn't work, and maybe they will fix it shortly. I had the bug come back again last night, Rarescanner locked my keyboard from pressing spells inside Motherlode +14. Turned Rarescanner off and I had keyboard control again. That bug was supposed to be fixed some time ago but it appears under certain circumstances. I really hope this gets fixed or looked at. I don't know why raescanner would even have any control over locking my keyboard. That's weird, there was an issue that locked the keyboard a long time ago, but it was fixed the next day and since then nobody else has reported it. I asume you are using the last version of this addon, right? The only thing I can think of is to do a clean installation of the addon, just in case you have something old messing around. Do you get any LUA error when that happends? Are you using another addon that modified RareScanner whatsoever? I didn't get an LUA error no. I always check for addon updates everyday. I haven't modified rarescanner no. I've changed the base settings though. I only just fresh installed this mod again after not using it for some time, so it shouldn't be any old code. I'm going to keep rarescanner turned off for now. When did you start noticing this error again? Have you been using RareScanner all this time without issues and sunddenly the error showed up? I've been reviewing the code that reads the keyboard input, and everything seems right, actually I've been doing some tests to try to simulate the error... but nothing, everything works fine. I have made a couple of changes, but I don't think they are going to affect whatsoever... just to try. I will release a new update soon, with some new translations, and this tune will be included. Please if you read this, answer me the two questions. I have been using rarescanner without issue, and has only just happened this week. Not sure when the last update was. I did run into the issue off keyboard locking but that was fixed some time ago. This is the fist time I've seen it come back since that last keyboard lockup update. Since turning rarescanner off I have experience no keyboard lockup. ***The lockup did happen inside a dungeon so I'm not sure if rarescanner uses anything different in dungeons or interacts some way with another mod inside a dungeon. Hello again! thank you for your answers. I was asking you because the addon hasn't changed at all in how it behaves with the keyboard since that day that you mentioned, so maybe the issues are caused by another addon + RareScanner (considering that as soon as you turned it off it stopped producing issues). Do you know if you have updated another addon recently that might interfere somehow with RareScanner? EDIT: I have release the version 5.3.6 with a little change related with your issue. I don't think is gonna change anything, but give it a try. It would be nice if you could try it just using RareScanner, but I know that might be a pain, considering that you get your error radomnly. I was doing darkshore today and saw this graphical bug. Not sure how to replicate it, but had to reload to fix it. There are another couple in WOD/Legion, but don't worry about them, the only issue here is that they look ugly, just ignore them. I think you are the first one that realized about this! You can disable the alerts from events or treasures (General -> Toggle searching treasures or chests), but as you said, they will still show up on your map. The only thing that you can do right now is to set the hiding timer to 1 minute (Map options -> Timer to hide container icons (in minutes)), so after 1 minute every container that you find will disappear from your map. I will add an option to chose which icons you want to have in your map, so you can disable them separately. Edit: Hello again. I have split the filter to disable world map icons in three options (disable rare NPCs icons, disable container icons and disable event icons). I will release this change next week with RareScanner 5.3.5): I want to have more time to test it properly and give time to the translators so the new strings will be available in more languages. Hi - so what are the pre-MoP NPC and Zone filters for, if they are not supported? Hi so atm im hunting a rare in Dustwallow marches called Ripscale, its listed as a rare on wowhead and has the dragon but isnt shown by the scanner. is this an issue with the scanner or am i misunderstanding what type of rares the scanner shows? Hello HorrorCorp, and sorry for taking so long to give you an answer. 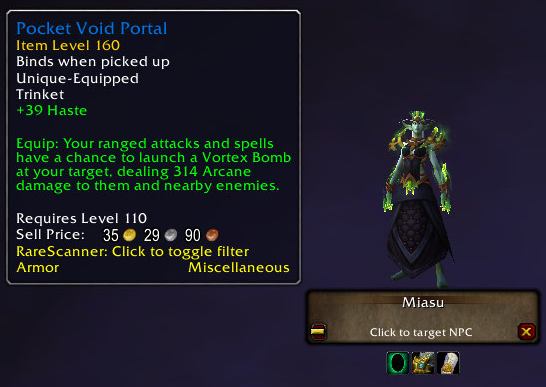 The addon only alerts you from rares starting with Mists of Pandaria. So if it's in Dustwallow, I guess it's an old rare, so it's not supported. This scanner doesn't seem to show Mysterious Camel Figurine which is all I really care about. Does anyone happen to know of a scanner that does show it? Is there any way to add the northrend rares on this addon? I tried to add the time-lost proto drake, but couldnt see him in the list. Any tips?